a quantity requiring a good microscope to perceive; but such a quantity is very readily measured by the interferometer. It means a displacement amounting to several fringes, and this displacement may be measured to within a fiftieth of a fringe or less; so that the whole displacement may be measured to within a fraction of 1 per cent. Of course, with long bars the attainable degree of accuracy is far greater. Figs. 50 and 51 represent a piece of apparatus designed by Professors Morley and Rogers,1 based on this principle, b and c (Fig. 50) are the two plane-parallel plates of the interferometer, and the two mirrors are at a and a'. 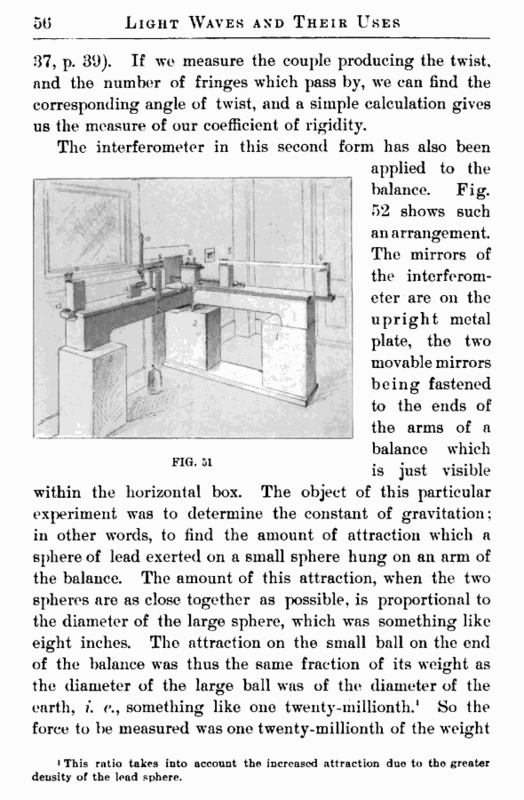 Each mirror is divided into two halves as at an, so that a motion of each end of the bar to be tested can be observed. The jackets gg serve to keep the bars at any desired temperatures. 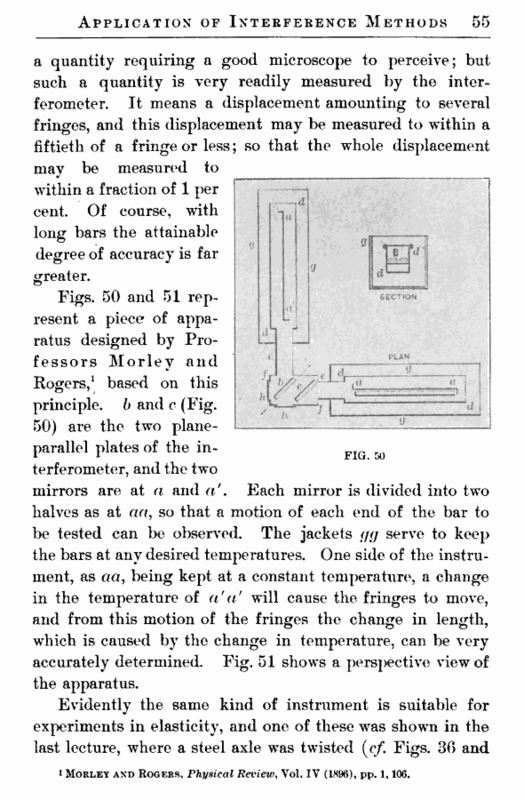 One side of the instrument, as aa, being kept at a constant temperature, a change in the temperature of a'a' will cause the fringes to move, and from this motion of the fringes the change in length, which is caused by the change in temperature, can be very accurately determined. Fig. 51 shows a perspective view of the apparatus. i Morley and Rogers, Physical Review, Vol. IV (1896), pp. 1,100.